This week, 13 December brings us the year’s final Full Moon – a Supermoon in Gemini, the sign of the Celestial Twins, and communicator of the zodiac. Universal energies favour dialogue and partnership, so if there’s a conversation you’ve been meaning to have, this Supermoon could set the stage for something meaningful. A quick PSA though: by all means open your heart, but when you open your mouth, beware the risk of over-sharing and miscommunications arising. Just so you know, we’re in the shadow period of this year’s final Mercury retrograde beginning 19 December (more about that in next week’s post!). With that in mind, here’s This Week’s Tarot! LEFT: EIGHT OF CUPS REVERSED. Upright, this card depicts the necessary wisdom of walking away from relationships, situations and beliefs that no longer serve your highest good. Reversed, this wisdom has not been heeded: either you’re stuck and unable to walk away, or you’ve rushed your strategic retreat with unexpected consequences. Time to back up and reflect on how your actions (or lack thereof) are affecting your future. Oftentimes, our fear of the unknown holds us back from achieving our best interests through the best means. We don’t intentionally set out to sabotage ourselves, but it happens when fear takes over and freezes us, or makes us say/do things we regret. There’s no shame in owning our missteps; what’s important is that we ask ourselves the tough questions and take the necessary actions to get back in the game. MIDDLE: FIVE OF CUPS. One word for this card: disappointment. A lone figure grieves over three spilt cups of wine. 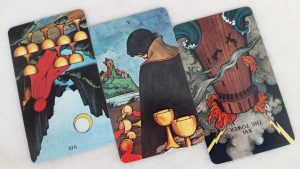 The broken-down castle in the horizon indicates what seems to be a bleak situation; however, bearing in mind that houses and castles in the Tarot tend to represent our beliefs and attitudes, could all this bleakness be a matter of perspective? Behind the sorrowful figure, two cups of wine remain standing. He only needs to turn around to realise that not all is lost. If this card speaks to you, understand that Spirit has compassion for your disappointment, but also encourages you to consider adjusting your perspective. There is hope. RIGHT: THE TOWER REVERSED. In both upright and reversed positions, The Tower signifies major change and opportunities for growth, sent by the Universe and often taking the form of crisis. Especially when it’s upside-down, The Tower urges us to let go of our old, self-limiting assumptions; The Tower shakes loose our grip on safety nets and security blankets, and sends us flying through the air. What to do when this happens: breathe deeply, roll with the punches, and keep the faith that this can end well. You will learn, and you will grow. Remember you’re loved by Spirit, and the Universe is kind. You can do this! Have a great week ahead!